Our Annual Autumn Sale starts Saturday, September 21. 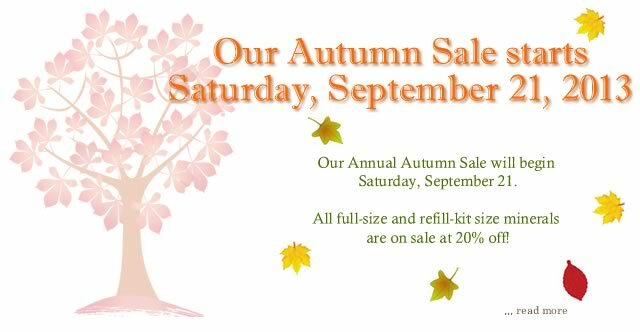 From Saturday, September 21, 2013, until Sunday, September 29, 2013, all of our full-size and refill-kit-size minerals will be on sale at 20% off. Please be sure to stock up on your favorite Buff'd mineral products as once the sale is over our next sale is not until the end of December 2013! Sale ends midnight Sunday, September 29, 2013.